La Zagaleta golf course in Malaga. Golf in Costa del Sol, Spain. La Zagaleta Country Club is one of the most exclusive residential areas of Europe located a few kilometers from Marbella. 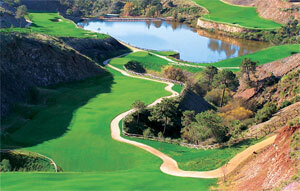 It is a private urbanization of nearly 900 acres with two 18-hole golf courses and private facilities for members only. La Zagaleta enjoys spectacular views over the Mediterranean Sea, the Strait of Gibraltar, the African coast and its magnificent golf course, which is surrounded by lush greenery, thanks to the abundance of water supplied by natural lakes and springs. The beautiful 18-hole golf course, designed by Bradford Benz, offers a longitude of 6.000 m with fantastic and breathtaking views and is one of the most selected courses in Spain. Among the private facilities for members is outstanding the clubhouse with almost 5,100 m2, which has a pro-shop, restaurant, bar, swimming pool, billiard room, bridge room, party room, tennis courts etc. Being undeniably one of the most prestigious country clubs in Europe, La Zagaleta also has a heliport and an excellent installation of the Equestrian Club. Address: Ctra. Ronda, Km. 38, 29679 Benahavís, Malaga. 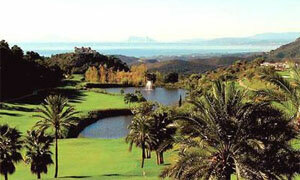 How to get there: The course is 18 km from Marbella city centre and 77 km from Malaga airport. Road access is very good following the national road N-340 or the highway A-7 in direction to Algeciras, taking the exit to Ronda (exit 172 to A-397). It is about 10 kms drive up the Ronda road.